In our number of years in the business, we have answered different questions related to repairs, towing, parts, and similar matters. To better assist you, we gathered the most common questions we encounter. We hope you will find the answers beneficial and helpful to you. What happens if I wait a few thousand extra miles to have my oil changed? Oil changes are one of the critical maintenance items you should be sure to do as recommended by the manufacturer. There are over 10,000 moving parts in a car. Oil and its additives are what keep them from grinding against each other. At 3000 miles, the additives in the oil, which are what actually protects moving parts, have broken down to the point of being mostly ineffective. That means it's harder for parts to move and increases their wear and tear, costing you money down the road for replacement when regular oil changes could have prolonged their life. Why does everyone make such a big deal about timing belts and changing them at around 70,000 miles? To replace your car's engine, it will cost over $5000. To replace your car's timing belt, depending on the make and model, should cost about $500 to $700. The timing belt, very simply put, makes the engine run. When the timing belt fails, the engine seizes and typically, that is the end of that engine. Why is it that auto shops suggest replacing the water pump at the same time as the timing belt? 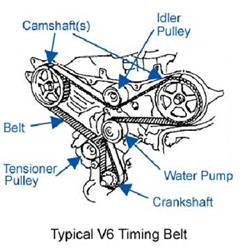 The majority of the cost of replacing a timing belt is due to the labor because of the location of the timing belt in the engine compartment. As you can see from the diagram, the water pump has a similar location. The water pump pushes engine coolant through your car's cooling system. That makes it a very important part to a functioning care. Rather than incur the labor charges to replace the water pump separately, we recommend you replace both at the same time. The additional cost to replace the water pump while replacing the timing belt, depending on make and model, is around $100-$200. What does it mean when it feels like my car hesitates upon acceleration? I smell something burnt when I turn off my car and get out. What could that be? It depends on the type of burnt smell. If you've had a recent oil change, it's possible some drops of oil landed on parts that get hot when the engine is running. It will burn off quickly and you shouldn't continue to smell it. If the smell continues, bring it in to Honest-1 for a diagnosis. Your engine should not smell burnt. When I look in the rearview mirror, I see blue smoke coming out of the back of my car when I accelerate hard. What is that? Your engine is most likely burning oil and it's exiting from underneath the car, not from your exhaust system. Bring it in immediately as oil leaks due damage to other working parts in your car. I've noticed my car pulls to the right when I'm driving on the highway. Is there something wrong with my tires? Although it's possible it's your tires, it's more likely that your front end is out of alignment. Front-end alignments are inexpensive and not only make your car safer, but they extend the life of your tires. When I put my car in gear, there's a delayed reaction. I hear a clunk sometimes as well and the car is not upshifting like it used to. What causes this? Based on this description, it sounds like something related to your transmission. There are lot of components that affect the transmission so it's important to bring it in to Honest-1? so our mechanics can diagnose the specific problem and make a recommendation. If you do need repairs on your transmission, be sure to ask about our VIP Coupon. It has coupons in it to help out with your repair costs. My car is starting to sound like a hot rod even when it's idling. It's getting hard to have a conversation inside the vehicle. That is most likely your exhaust system making noise. It could be a loose fitting or a hole somewhere in the exhaust. It will only get worse and you can get fined for noise violations. Bring it in and we'll tell you what's wrong and how much it will cost.